Picked one up at Cabela's Friday on sale 100.00 off. Very nice pistol so far. Action's a little rough-cylinder drags over the cylinder stop~ enough to mark the pellet cylinder... which is about the only foible I can find with it. It shoots well enough at 10 of my longish paces- probly 12 yds or so. That's 10 shots as fast as I could in single action. Temperature was only 7.6 C, so the CO-2 obviously can't keep up that fast. 8.2 gr. RWS Meister wadcutters. It's a bit of a pig on gas~ 41 shots, and then the Meisters lodge 1/2 way between the cylinder and the forcing cone. I've had an 686-6 for about 6 months now and really enjoy shooting it despite its weight. I found the Meisters even if properly seated would occasionally jamb in the cartridge/gun or even occassionally fall out ( I've had the same problem with them in the cartridges for my Walther lever action). I switched to JSB 7.33 @ 4.52 and have fond them to work very well but they are not a wadcutter. I have recently tried JSB Target Sport wadcutter 8.02 @ 4.50 and so far they seemed to work OK and provided excellent grouping. With 10 shots from a bench rest at 25 feet I was able to place 8 shots within a 1/2 x 3/4 group with 8 pellets and 2 other slightly to the right which I feel was the shooters fault. This confirmed to me that the gun is very accurate - much more than this shooter is capable of doing freehand - LOL. I have found that 50 shots per CO2 works best for me and have purchased 5 clips which helps me to control the number of shots per CO2. It is an accurate fun gun - just takes some practice to get used to the weight. Hope you enjoy your's as much as I'm enjoying mine. I'm liking the 586 a lot, so far. Have some RWS R-10 match pistol wadcutters to try in it too- 7.0 gr if I remember correctly. I ended up with a 25 carton of Daisy C/O-2 when I bought the gun~ could be cause of low shot count. It's pretty stinky stuff, like rotting onions. I don't find the 586-6 all that heavy. I think it's slightly lighter than my c/o-2 Beretta 92-F. It's balance is good. Jury's still out on the Hogue clone grips. A bit much of downward taper... Sights are sort of borderline for my aged eyesight. Got a bit of research to do on the sights, and see what replacements are available. Fingers crossed for a mild week-end so's I can put it through a thorough shoot. Have the 586 4 inch and 686 shooting indoors. Accurate shot count always 40 per CO2 with JSB Exact Express and JSB RS. The markings made on the rotating cylinder are normal wear. Many owners regard this as most accurate Umarex model. Appreciate the info. Just purchased this one and waiting on delivery. I have a 586 as well. It's a recent purchase. Find it lighter than my Beretta f92. It is an accurate, well made and strong shooter. I find the RWS super dome 8.3 work best. I have not had a jam yet since using this pellet. It’s pricey pellet gun, but worth it, specially if it comes on sale. I am 77 too and target shooting @17 feet with 686 and laser on top for accuracy. I have never got more than exactly 40 full shots indoors ! Nice purchase. Where did you find it at Cabela's? It doesn't seem to be listed on their website. Only the S&W TRR8 357 air pistol. Anyone know how it compares to the Colt Python shell loading revolver? Since it is pellet with rifled barrel & the Colt is BB with smooth bore barrel, is it a lot more accurate? 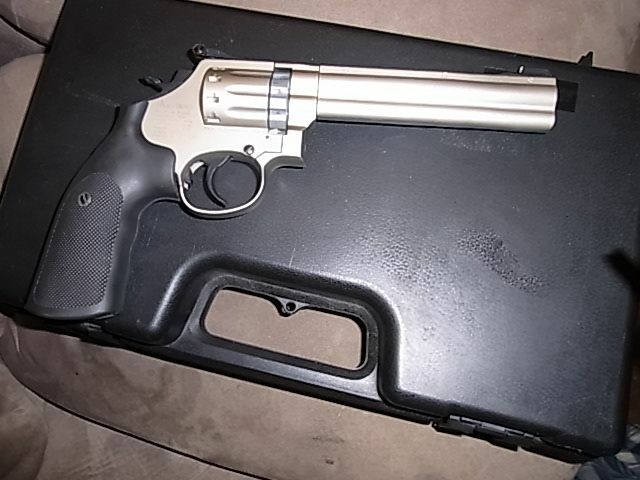 I have a version of the Colt Python (a Swiss Arms 357, 6" barrel) and find it is fairly accurate. Anyone know if this stock is sold in Canada? Haven't had a chance to shoot her much; but VERY happy with how she looks! Excellent revolver and well worth the price for both build and accuracy. I was sad to part with mine. Compared to a Colt Python? No comparison.